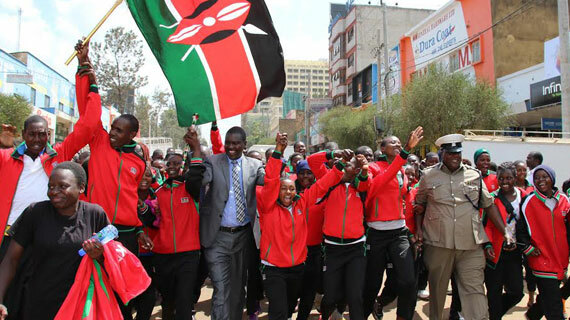 Uasin Gishu Governor Jackson Mandago today flagged off Team Kenya for the East African secondary school games set to kick off on Saturday in Eldoret. Mandago assured the team of the support throughout the games “I want to reiterate that we are fully in support of the games. I am calling upon the students and anyone else to observe high levels of discipline during the competition,”Mandago said. Meanwhile Kenya Secondary School Sports Association chairman Kimutai Ng’etich is confident of retaining the overall title, “Last year we won the overall title and the teams have trained well for the games and we are ready for the battle,”Kimutai said. According to Kimutai, they will be eyeing to reclaim men’s football title with national champions Laiser Hill, Passenga, Barding and Bukembe representing Kenya in the onslaught. Kenya also lost volleyball title to Rusumo of Rwanda and are pitted against Cheptil and Tetu of Kenya, Ld Nyanza of Rwanda, Luyanzi of Uganda and Makongo of Tanzania. “Being at home, we have to do more to shine in the entire field and we will be seeking to reclaim the soccer crown,”Kimutai said. Basketball girls-St. Marys Kitende (Uganda) vs Nabisusa (Uganda), Buruburu vs LD Kigali (Rwanda), Kaya Tiwi vs Barchando (Kenya), Buddo (Uganda) vs Juhudi (Tanzania), College Gesenyi (Rwanda) vs LD Tanganyika (Burundi). Hockey boys-Kamusinga (Kenya) vs Upper Hill (Kenya), St. Athony’s Kitale (Kenya) vs St Mary’s Kasasa (Uganda), Kakungulu Memorial (Uganda) vs Ntare school (Kenya). Handball Girls-Matuu Memorail (Kenya) vs El.Technique (Burundi), Matuu Memeorial (Kenya) vs Sega Girls, Mbogo (Uganda) vs Moi Girls Kamusinga (Kenya), Apega (Rwanda) vs South Sudan. Handball Boys-ES Kigoma (Rwanda) vs Mwanakwerekwe (Zanzibar), Makongeni (kenya) vs Kibuli (Rwanda), Kimilili (Kenya) vs St. Peters Chesirikwo, Gisenyii (Rwanda) vs Dynamic (Uganda).